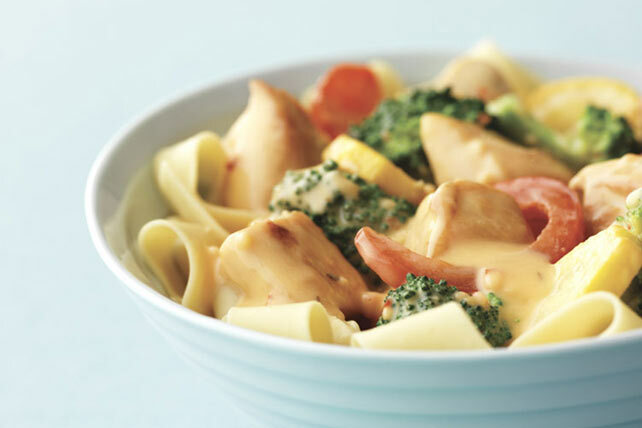 We promise your pickiest eaters will love this creamy, cheesy chicken noodle dish. Bonus: There are some really yummy veggies in there too. Microwave VELVEETA and milk in small microwaveable bowl on HIGH 2 to 3 min. or until VELVEETA is melted and mixture is well blended, stirring after 1-1/2 min. Add to chicken mixture; mix lightly. Serve over pasta. Add 1/8 tsp. crushed red pepper to the combined VELVEETA and milk before microwaving as directed. This broccoli and peppers team up in this colorful, low-calorie, low-fat main dish to provide both an excellent source of vitamin C and a good source of vitamin A. Makes 6 servings, 2 cups each.